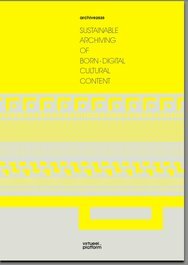 The book Archive2020 – Sustainable Archiving of Born-Digital Cultural Content discusses the many issues that arise when digital content is being archived. Although a lot of material currently is being digitised, other digital material threatens to disappear from the public domain. This is due to software and hardware developments, migration issues and the rise of fast Internet connections. Together with experts from the field of digital archiving, the Virtueel Platform conducted a research on the sustainability of digital archives, content and culture. The book can be downloaded as a pdf or ordered for free, both on the website of Virtueel Platform.